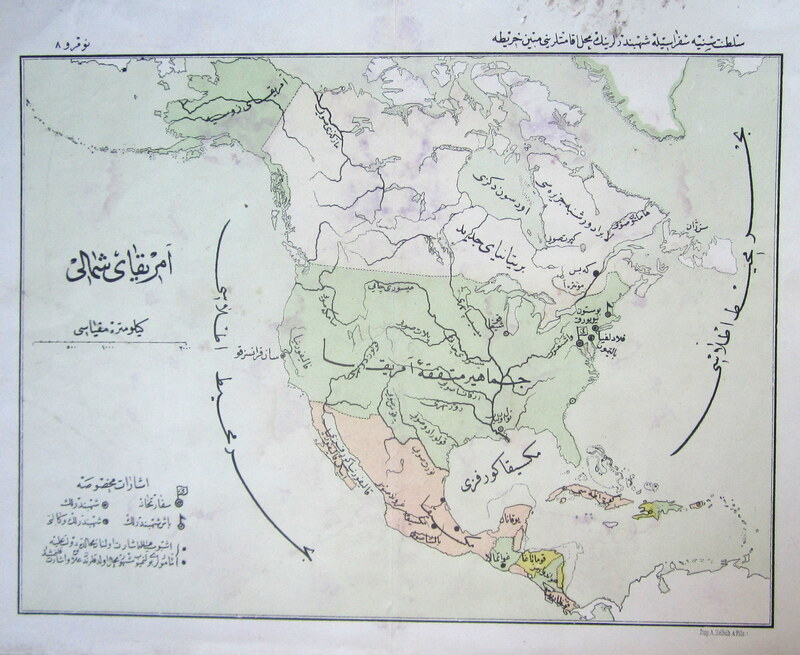 Given that American students are not known for their knowledge of geography, even if this very late Ottoman (1919/1920) map of North America from the education ministry will seem an inadequate representation of the US and its neighbors, it might well do some good in today's classrooms at the very least as a historical document. Printed by Dalmatian immigrants and lithography pioneers of the Ottoman Empire Zellich & Sons, the map has its idiosyncrasies. Only a few cities such as New York, Boston, Philadelphia, Baltimore, and Washington are labeled on the East Coast. For the rest of the country, only Chicago (spelled Chigaco), New Orleans, and San Francisco merit mention. Of course, the US had far fewer cities during that period, but there is still a clear Ottoman-centrism reflected in the labeling of consulates (şehbenderlik) and the embassy that marks Washington, DC with a big Ottoman flag. This being said, it is worth noting the large number of consulates, which should be a reflection of the extent of migration to North America by communities from the Ottoman Empire during this period its commercial ties with the United States. This representation is also not without its imperfections. The State of California is mislabeled as "Falifornia" and Mississippi looks more like "Mississippa," a forgivable error given dialectical variation. There appears to be an Ottoman consulate in Charleston based on the placement of the dot, though the city is not named. The naming of Alaska as "Russian America" is more anachronistic than entirely incorrect given that Alaska had by this time been a solidly American territory for over half a century. Likewise, the term New Britain from had fallen out of favor following the establishment of the Confederation of Canada in 1867. A less forgivable error might be labeling the Pacific Ocean as the Atlantic Ocean, creating the strange impression that the Americas are entirely surrounded by the Atlantic and therefore the rest of the world must not exist. Yet, to return to my original point about American students, I must admit that I learned a thing or two about the geography of North America from this map, namely that the Colorado River is actually in Texas.